Eric Broadley, founder of Lola and one of the most visionary designers and constructors of racing cars, has died at the age of 88. Broadley, along with Colin Chapman, John Cooper and Major Arthur Mallock, was responsible for the pioneering early boom days of the British motorsport industry, as he masterminded a remarkable variety of Lola models. From the 1958 Lola Mk1, which was created using his £2000 savings and designed and built at a ramshackle West Byfleet workshop, to the mighty Lola T70s of the 1960s, the fearsome F5000 cars of the 1970s, and the customer Group C and F1 cars of the 70s and 80s, Broadley and his team created some of racing's most iconic designs. After an early foray in to Formula 1 with the Reg Parnell-run Bowmaker Lola Mk4 cars in 1962, Broadley presided over a number of Formula 1 projects during the next 35 years. These included the first ever Honda win in 1967 - the RA300, based a Lola design and dubbed a Hondola, won the Italian Grand Prix in the hands of the late John Surtees. Broadley was also behind the Graham Hill-fronted Embassy Hill operation in the 70s and the Larousse Lola of the late 80s and early 90s, with each one of these projects enjoying their moments in the sun as Broadley's team in Huntingdon cemented its reputation as one of the leading customer-focused operations in the world. Lola's record at Indianapolis was the best of any overseas constructor from the 1960s to the 1990s. 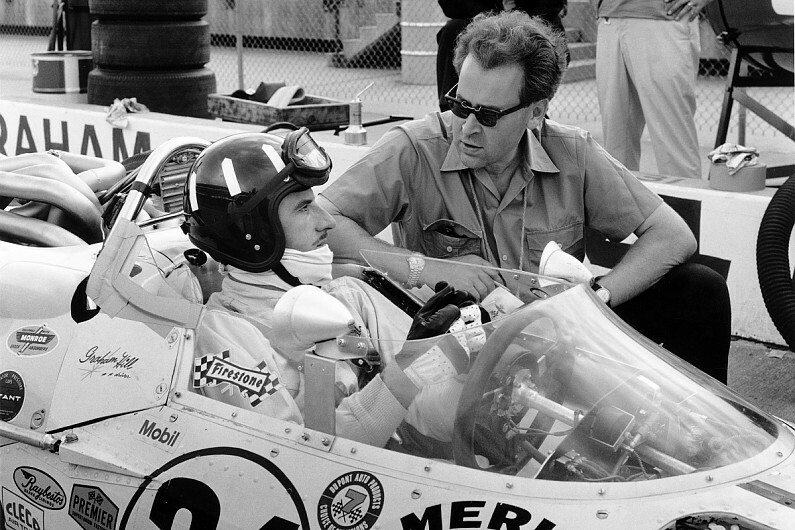 Graham Hill (pictured with Broadley below) became the first English driver to win at the Brickyard in 1966 with the Lola T90 Red Ball Special, while Al Unser Snr took the 500-mile triple crown - Indy, Pocono and Ontario - in a Lola T500 in 1978. Mario Andretti, Bobby Rahal, Al Unser Jnr, Cristiano Da Matta, Nigel Mansell, Paul Tracy and Michael Andretti all took CART and ChampCar titles in Lola chassis, while Arie Luyendyk took a third Indy 500 win for the constructor in 1990. All this was done against tough competition - March, Reynard, Ralt, Brabham, Eagle, Penske, the list goes on. Lola was always enormously respected by teams, drivers and engineers as a quality competitive constructor. Broadley himself was quiet yet confident, but also often displayed an impish sense of humour that endeared the thousands of staff that worked at Lola. He was what would now be considered an old school engineer, who was never more at home than designing and developing a racing concept. The business element of his vision was usually directed by others, notably Derek Ongaro and Mike Blanchet. His achievements as the brains behind Lola are staggering, and it says much for his benign and quirky personality that he was known as the 'engineer's engineer' rather than an effervescent personality such as Colin Chapman, Ken Tyrrell or Ron Dennis. Like his beautiful creations, such as the Lola Mk6, Lola T212 and Lola T332, Broadley's actions as an engineer always led by example. There was little, if any, significant ego related to his work, but this didn't mean the man wasn't fiercely competitive. Indeed, a deep-rooted drive to compete was what set him on a remarkable journey as head of Lola. In Formula 1 it never quite happened for Lola, yet still some memorable programmes scored respectable results. As well as the Hondola of 1967, there were the Larousse years when particularly in 1990 Eric Bernard and Aguri Suzuki punched above their collective weights to score a decent haul of points, including a podium at Suzuka. By 1997 the Lola empire hit trouble after an ill-advised decision to return to F1 with the fateful Mastercard deal that failed so miserably. With Lola on the verge of collapse Martin Birrane bought the brand and set about rebuilding and investing in it. Broadley was involved in various projects after Lola but largely enjoyed a peaceful retirement at his farmhouse in the village of Broughton close to Huntingdon. Even after his era had ended at Lola, Broadley would occasionally frequent the workshops and talk to old employees. 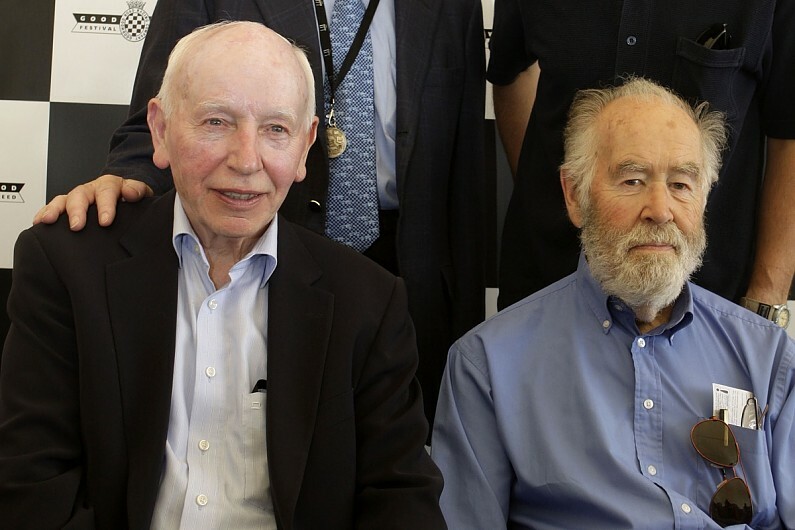 In 2008 John Surtees (pictured below with Broadley at Goodwood in 2008) drove a Lola T70 MkIIIB around the streets of Huntingdon with Eric in the 'passenger seat'. His joy at the occasion was typically reserved but genuine in its delight. Some notable engineering names passed through Lola's doors, originally in Bromley, Slough and then from 1971 to 2012 Huntingdon in Cambridgeshire. Tony Southgate, John Barnard, Bob Marston, Patrick Head, Ralph Bellamy, Mark Williams, Ben Bowlby and Julian Sole all worked for Broadley in various stages of their careers. Those who knew and worked with him will remember him with affection. The quiet man of racing, his vision and dedication to Lola deserves the same respect in which Chapman, Williams, McLaren, Dennis and Brabham are rightly lauded, because the influence he extoled to the motorsport industry was so vital.